Render a scene in the Render Scene in Image Node. Set multisampling to any parameter > 1. 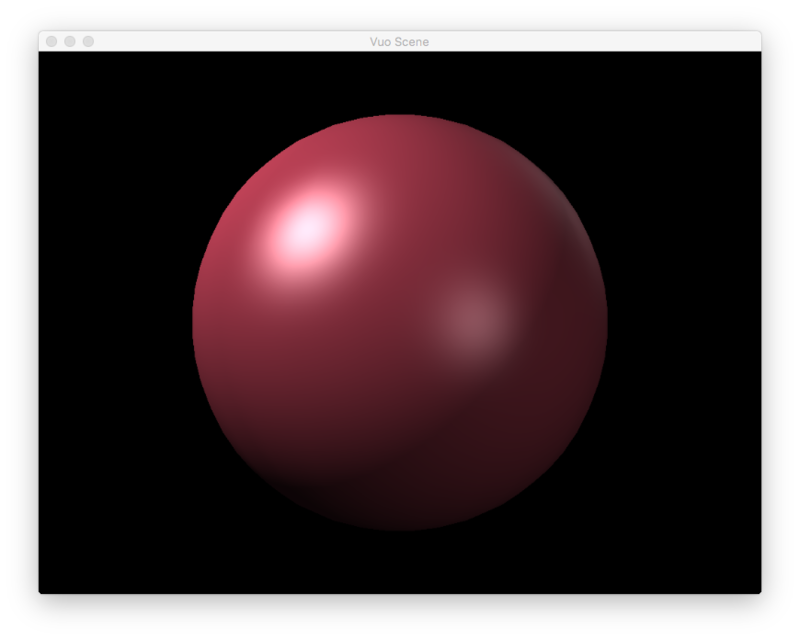 I join the modified example composition "Render Sphere". Hope it's not my Graphic card again :( I can post my computer specs again if needed. Render Scene to Image also slows the framerate a lot. For example the joined composition A runs at 60 fps in alpha 3, drops to 30 fps in alpha 4. What makes me think that Render Scene to Image is the concerned node is that the same composition rendering directly to the window instead of in an image (composition B) stays at 60 fps, even if in alpha 4. The only difference when running composition A in the two Vuo versions is the fact that the points are not shaded in alpha 3 (that bug I mentioned and that has been solved). PS : I could have used the new Make Random Points Object to build the points but I wanted to be sure no other new nodes were used. After reflexion It could also come from the "Render Image to Window" node but I doubt that. However, I think I know which change may have caused this to break. I'll see if there's an alternative that will work better on ATI GPUs. I will update this thread's title to Intel HD GPU instead of ATI. I once originally started a bug report from another computer, an iMac with an ATi Graphic Card and could reproduce it on my Intel HD 3000 too.. It was this bug here Built-In Sample Compositions using Displace With Image Bug Alpha 3. Alpha 4 solved the issue on my Intel HD 3000 MPB, I will be able to test this on the ATI iMac in December. Partially solved ! ALL THE OTHER BUGS I REPORTED ARE FOR THE Intel HD 3000 graphic card. I will try to clarify these bugs again so you can mark some solved bugs ! This recent bug When using point meshes, some shaders render incorrectly or don't render at all which affected my Intel HD 3000 MBP + Vuo's team ATI computer too. The Vuo Team changed the title to ATI GraphicCards as it affected your ATI computer too. This is solved for my MBP HD 3000 in alpha 4. B - Unsolved bugs for my Intel HD 3000. High CPU usage for high frequent events + meshes render on CPU instead of GPU This is still the case. Add noise to call rendering at 5 fps etc. (Perhaps the new OpenGL Vulcan version will allow nearer GPU access and solve this). Lagging Compositions on Startup seem a little better in alpha 4, but still not smooth. Make rugged terrain still take starts choppy, needs some seconds to smoothen. In 1.2.0-alpha4 (but not alpha3), "Render Scene to Image" outputs a glitchy image (+ slows framerate down) is the latest alpha 4 bug we are commenting here. The Vuo team changed this title to add ATI gpu but it's on the Intel HD 3000. I should have always post my graphic card specs again, my fault. Perhaps the Vuo team could want to merge my Intel HD 3000 bugs and copy-paste this text under a "Some Intel HD 3000 bugs" for easier overview. Don't know. Just ran the test received by email. The only app that does not glitch is CC-Byte. Both -Int and -Short glitch. The final Vuo 1.2.0 release used the technique in cc-byte, so that part of this issue should be fixed. …but I'll leave this bug report open to address that issue. 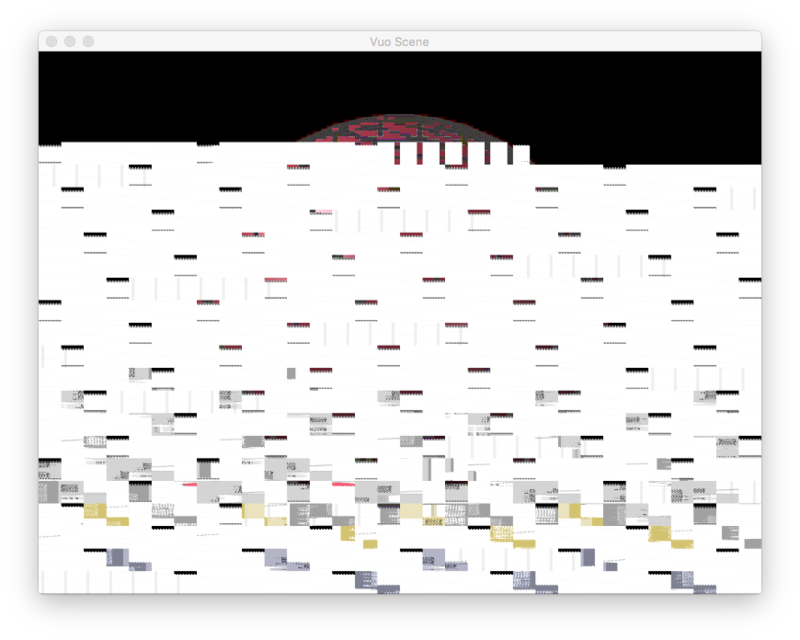 Vuo 1.2 solved this for multisampling up to 4x on my GC but still happens with 8x. Could the CC-byte have been omitted for the 8x ? Or it could be just my graphic card not able to multisample at 8 ;) ! Also saw this The parametric grid does not display hope it is not related. It turns out that multisampling is only supported up to 4x on the Intel HD 3000. In Vuo 1.2.2, we added a check to avoid the glitch if 8x is requested. In your first comment you mentioned a performance drop. We couldn't reproduce it on our Intel HD 3000. Could you retest at Vuo 1.2.2? If you still see a problem, please create a separate bug report.